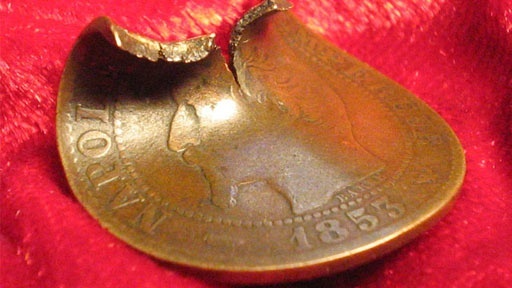 A contributor from Bath, Maine has an 1853 French Napoleon coin with a bent, split edge and a great bit of family lore: it's said that the coin was shot by Annie Oakley and that Annie herself gave the coin to two of the contributor's great-grand uncles. It doesn't look like any of the souvenir coins the Wild West icon typically handed out to her many fans. Can we prove that the sharp-shooting star of Buffalo Bill's Wild West Show shot up the coin for the two brothers - and turn family lore into bona fide bragging rights? To find out, History Detectives conducts ballistics tests, scours the Buffalo Bill Historical Center archives and recreates one of Oakley's sure shots. Also with Elyse Luray Muhlenberg Robe Was this robe torn off during a fiery sermon to rally congregants to the cause of the Revolutionary War? Related Investigation Broadway Ballet Shoes Did this dancer's great-great-grandfather teach Salvatore Capezio to make ballet shoes? Also with Elyse Luray Ronald McDonald Costume Is this the costume that helped serve up a billion Happy Meals? Also in Season 6 Black Tom Shell Is this shell from a devastating act of foreign sabotage on American soil?